I appreciate labels. Since being diagnosed with celiac, I’m a label freak. I carefully examine labels on everything from food to face soap. My health depends on it. So, I should clarify. I appreciate the proper place of labels. Labels belong on products. Not people. On products, labels are helpful. On people, labels are hurtful. On which side of “label slapping” have you been? I’ve been on both – giving and receiving. On the receiving side, the label of choice was “liberal.” “Phillip is just a liberal,” so it was said. * Labels don’t do much to enhance the conversation. Fact is, labeling seems to stop any conversation. Someone has said (experts are still looking for the source), “Great minds discuss ideas; average minds discuss events; small minds discuss people.” Ouch. * Once we label someone, we start to see only the label. We look for information that confirms the label that we have placed on a person. Want a “for instance”? President Ford was a great athlete, playing for two championship football teams at the University of Michigan, and being selected an All-American. Yet, after he took a tumble or two on the ski slopes and then slipped one rainy day coming down the stairs of Air Force One, he developed the reputation of being a klutz. Then when Chevy Chase impersonated Ford as a klutz on SNL, the label stuck. The joke was that VP Rockefeller was just a banana peel away from the Presidency. People will literally ignore anything that isn’t in line with the label they have given to a person. It’s tough to live outside of the label. Maybe living with a liberal label isn’t so bad. Some of the evangelical world’s most respected and quoted leaders hold views that would, by some people, earn them the same label. Wow. These guys have made some statements that certainly lie outside the boundaries of some theological systems. In some circles they’d be labeled liberals. Yet, we give their books to people sruggling with their faith. We quote them extensively. We hold them up as examples of Christian maturity and devotion. I’m all for it. I’m glad we do. But it begs the question: Why do these guys get a pass and others don’t? 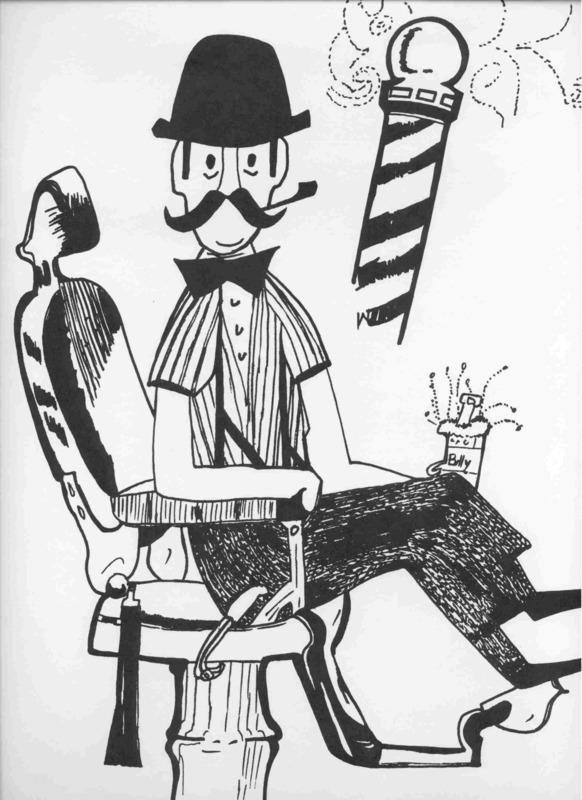 It was Saturday morning at the barbershop. Packed out. A family of four walked in. Mom and dad took the seats beside me. The two boys, I’m guessing around 4 and 6 years old, took a seat on the floor beside the table covered with the day’s newspaper, your typical array of barbershop magazines and a few children’s books. The youngest boy found Dr. Seuss’ Green Eggs and Ham and a big smile crossed his face. He hurriedly turned to the first page. Then it began. The brother-brother dance. Two kids wanting the same book. Parents, we’ve all been there. How would these parents negotiate the tug of war? “Give the book to your brother. You don’t know how to read.” Mom instructed the little guy. “Yes, I do. I’m reading it with my mind!” the young reader replied. While this “back and forth” went on, the little boy’s frustration as well as mine, grew. Not being able to keep my nose out of other people’s business, I stepped in. How about that? He really was reading with his mind! “You’re a good thinker and reader,” I said as we closed the book. I gave the kid a brief hug around the shoulder, walked out of the barber shop into the cold air, warm tears welling up in my eyes. We know the power of touch. It feels good to us. It is good for us. A touch in Jesus’ time was much more. It was the conferring of a blessing – a statement of acceptance and affirmation. How many “touches” am I giving each day? How many opportunities are there that I have missed? How many people have I ignored? In my own family? In my community? Best haircut I’ve had in a long time. 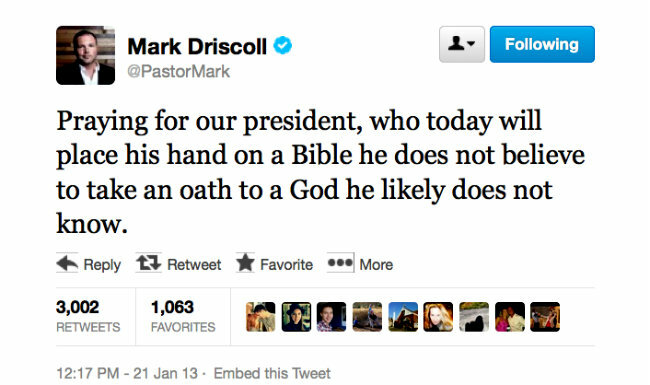 It’s old news now – Mark Driscoll, founding pastor of Mars Hill Church in Seattle, tweeted about President Obama during the Inauguration. I’ve stared at this tweet off and on, not knowing how to respond. Not knowing if I should respond. “Some thoughts are better left unexpressed,” I’ve told myself. “Better to keep your mouth closed and be thought a fool than to open it and remove all doubt,” advice I obviously have not followed in the past. News came to me this week, however, that made the tweet personal. Driscoll lobbed a bomb at the President. The pastor, along with all Americans, has a right to criticize our leaders and their policies. It’s the American way. No problem there. Driscoll’s tweet though was the delivery of a spiritual slam. The charge came as a result of a teaching I gave in September 2012. I’ve listened to the audio of that teaching three times – I never said what was said I said. The claim is made by those who hold an inerrantist view, that the trustworthiness of the Bible stands or falls with inerrancy. If the Bible contains any real errors it cannot be trusted. Then there is the admission that every Bible that exists probably contains errors. Only the original manuscripts can be considered perfectly inerrant. So…think along with me…if the Bible’s trustworthiness is based on inerrancy- as defined as “without error” – and only the original manuscripts – which no one has – are inerrant, then that does not bode well for the trustworthiness of the Bible we do have. That is why I like and hold the definition of inerrancy given by John Piper – “Perfect with regard to purpose.” The Bible’s main purpose is transformation, not information (2 Timothy 3:16), and it’s unfortunate that so many people spend their time arguing over the “information” part. The Bible is absolutely trustworthy to do what it is intended to do. Yeah, it’s a bit personal.